Posts on this blog may contain affiliate links. At no additional cost to you, if you click through an affiliate link and make a purchase, I may earn a small commission. I truly did not mean to make this post title rhyme. Sometimes things like that just happen. Just wait until I ACCIDENTALLY conjure up a haiku. Does anyone else suffer from not sleeping well in hotel rooms? 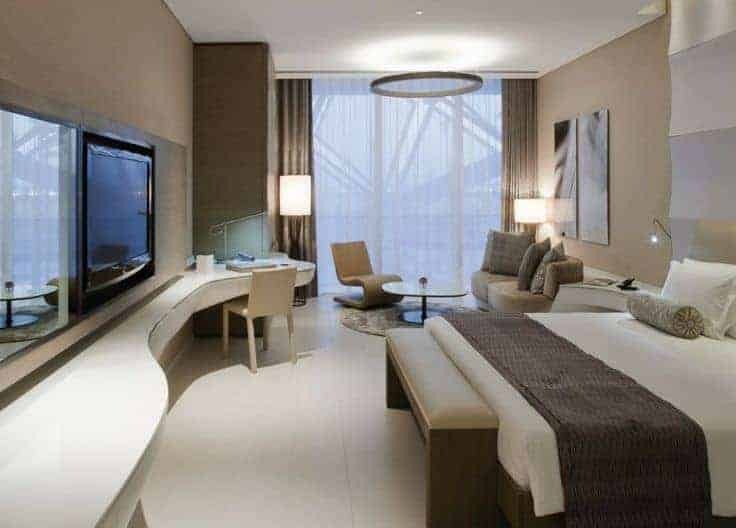 No matter how much I travel, no matter how lovely a hotel is, no matter how tired I am – I never manage to sleep well when I’m staying in a hotel. I call it travel-induced insomnia. The first night is usually the worst. I’ll toss and turn all night and maybe only get an hour or two of sleep. As someone who needs at least eight hours of sleep to function, it’s like my own personal torture. 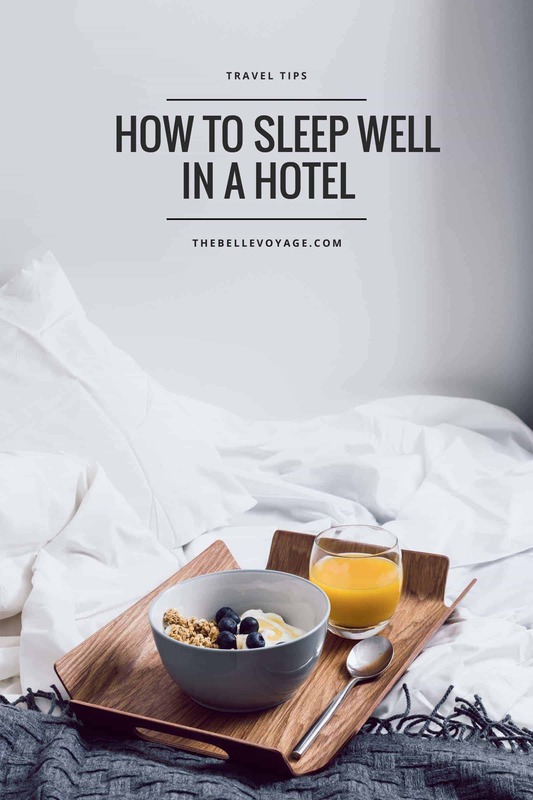 Here are a few tips I’ve learned over the years for how to sleep well in a hotel. And if you’re looking for more hotel room hacks, check out this post. I always try to pack a few little things that I know will help me sleep better. Obviously there are the basics: earplugs and an eye mask, but there are a few additional things I bring with me, too. Throw a few binder clips in your bag. They’re tiny and lightweight, but if you have a hotel room with drapes that don’t close all the way, you’ll be so glad you have them to clip the curtains together! It always helps to trick your senses into thinking you’re at home and in your usual bedtime routine. I love having two candles that have the same scent that I can light before bed: a regular size candle at home and a travel size candle to bring with me. This one is adorable! When I’m in a hotel room, the scent from the travel candle reminds my brain that it’s time to sleep. Jo Malone also makes candles that have matching travel-size versions. For earplugs, try to stick to something in the 30 decibel range, decibels being a measurement of how much noise is being blocked. You want something that will block street traffic or extraneous noise, but you still want to be able to hear your alarm clock. These earplugs are a great option, and they’re foam, which is comfortable to sleep with. Packing tip: keep a few pairs of earplugs in your suitcase so that you’ll always have them on hand – and won’t even think about having to remember them when it’s time to pack! An eye mask is also key. There’s a million options out there in terms of fabric, shape, scented, etc. so just find what works for you. When you check in, make sure to request a quieter room. Front desk agents know which rooms to steer clear of if a guest is looking for something very quiet. But in addition to that, make sure you give the room a good once-over when you arrive and before you unpack. Why? You’ll want to make sure that the room doesn’t have any hidden factors that will keep you from sleeping, and be able to switch rooms when it’s still easy. There’s nothing worse than tossing and turning at 3am and trying to decide if it’s worth packing up and moving rooms in the middle of the night. Make sure your room is far from the usual noise culprits: the elevator and other guests’ rooms. It’s great to have a corner room, or one at the end of the hallway. Personally, I think that other room doors opening and closing are even louder than the elevator, so sometimes I’ll ask to be put next to an empty room. Also: make sure you’re nowhere near the ice-maker or the housekeeping station which can be incredibly noisy – especially EARLY in the morning. Finally, check that your room has curtains or blinds that close completely. I once spent a sleepless night in a hotel room facing Times Square where the window coverings did not cover the windows completely. Nope! The blinds left a ONE-INCH PERIMETER of window around them. Needless to say, the flashing lights kept me up ALL NIGHT because I’d forgotten to check this ahead of time and at 3am, I didn’t feel like moving (see above). Finally, whenever traveling west to east, I recommend booking the early, early morning flight. Don’t get me wrong: I hate 6am flights. HATE. But it’s the fastest way to get on east coast time coming from California. It’s exhausting, but I’d rather be tired on a day when I’m flying, than worn out the next day because I couldn’t sleep. Hope these help you get some beauty sleep next time you’re on the road! If you have other tips I would love to hear them. Wanna Learn to Pack a Suitcase Like a Boss? Success! Now check your email to confirm your subscription and download your files. A Midwestern girl turned Southern Californian, Jessica knows how to live life out of a suitcase without foregoing her beauty and fashion favorites. She has lived and studied on four continents, regularly cross-crosses the U.S. for business, uses her vacation days to embrace new adventures, and always has her travel makeup bag packed and ready to go. Wanderlust meets style at The Belle Voyage, a lifestyle diary dedicated to women who travel. I'm Jessica, and thanks for stopping by! Read more about my story. Ready for more stylish travel? Let's keep in touch!